When my parents arrived in Tanganyika in 1949, they were sent to the Rondo Plateau, a remote area in the south, where my father’s job was to map a forest. 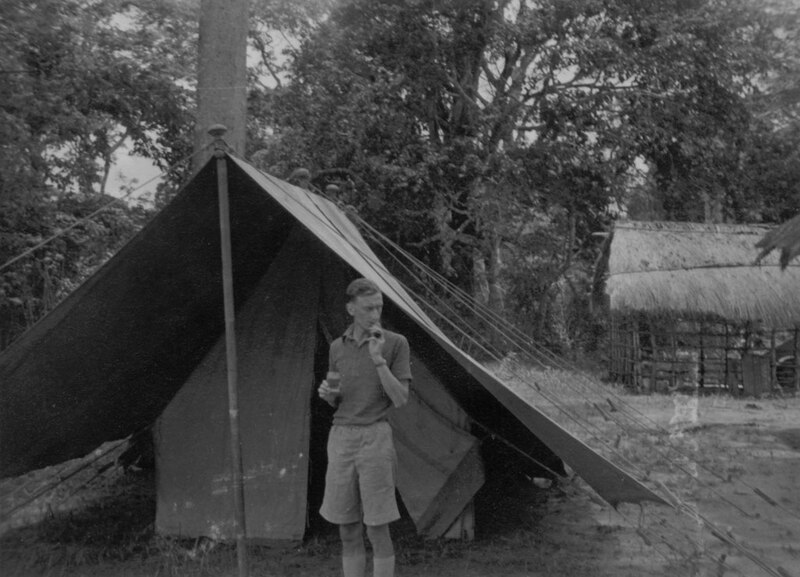 This he was to do by foot safari, camping in the bush for up to weeks at a time, with a team of porters to carry the tents and provisions. Before she became pregnant with me, my mother went on foot safari with him. I have the pictures they took – a record of the dying days of colonialism, the white administrator with his canvas bath, dinner served at a folding table by lamplight, my mother washing her hair in a stream…but my memories are all of Moshi, where we lived from when I was three to seventeen. My parents spent nineteen years in Tanzanian Government and left in 1968. Until very recently, I had never been back. For maybe 15 years after we left, whenever I was asked where I came from, I always said ‘Tanzania’. Then one day I woke up and realized that I had a British passport, I had left at the age of 17, and I couldn’t claim it in that way any longer. But where was I to say I was from? My whole life, whenever I’ve been asked to look at anything, I’ve looked at it from the point of view of someone born in Africa, with a sense of how the world looks from that particular perspective. I feel most at home on African soil. This visit was the first time I’d had the courage to go – what shall I say? ‘back’? ‘home’? As soon as I say that, I know you can never go back, and I know it isn’t home in any real and practical sense. But when I told people I met that I was born in Lindi and they exclaimed, ‘But then you’re Mtanzania!’ – Tanzanian – I needed, after all these years of absence, to believe it. 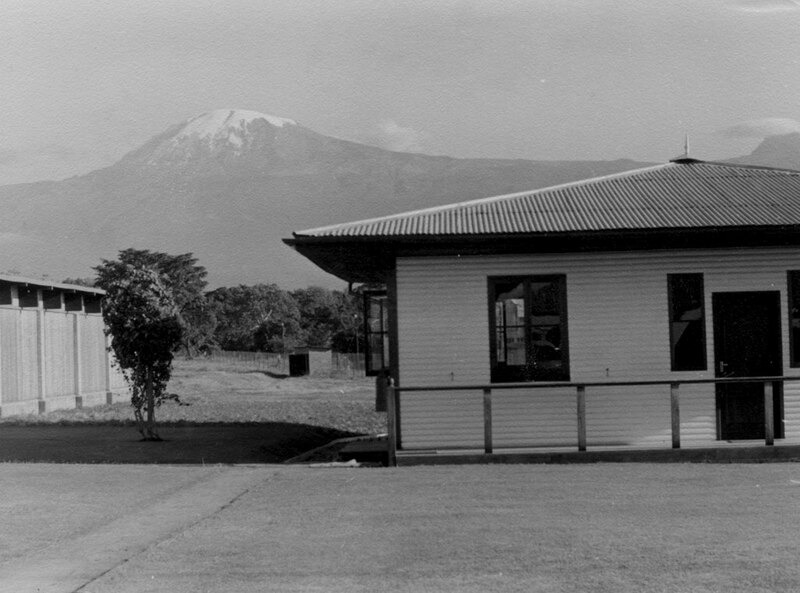 When I got to Moshi, I stayed at Keys Hotel, an old established hotel used by mountain climbing parties. It was dark when I arrived and I fell into bed exhausted. Next day, I came to to the sound of people in the car park below getting into vehicles to set off for the mountain, and a great wave of realisation broke over me. I was in Moshi again, a place I had visited only in my dreams for the last 36 years. When my parents left, I was back in my English boarding school, so I left without even saying good-bye. Throughout the next 36 years, a recurring dream carried my spirit back to Moshi. In it, I followed the hard-packed red earth bush paths I used to walk as a child, the great snow-capped peak of the mountain floating above the crumpled white cloud-sheets which had shrouded it all day, and now lay discarded at its feet. I call it the Walking Dream. This morning, the mountain is obscured as I set out towards the town centre. I have no concrete plan. I am simply going to walk until I see something I recognise, and keep walking, and at some point I know my feet will carry me to the house. This is a Walking Dream, except that I am really here, and the solidity of the red soil beneath my feet reinforces its own reality. There’s the roundabout and the road to town, there’s the mosque with its multiple green-tipped minarets, there’s the Hindu temple, smelling of incense, and I’m walking down a street of shops, and in front of one of them, I come to a halt. The building is semi-derelict, its windows blank, its structure crumbling, but on the front, quite clearly, is the name: ‘Mulji’s Emporium.’ Mulji, the Indian shopkeeper from whom my parents bought single jars of the expensive delicacies he imported to please European tastes. Cooper’s Oxford Marmalade. Branston Pickle – in our house, there was a saying, ‘Branston Pickle is not for children’, which meant we coveted it more than anything. Lea and Perrins. Angostura Bitters. Heinz Tomato Ketchup. Glancing through the door of the nearest shop, I see a couple of Indian men chatting behind the counter and I duck inside and ask them about about Mulji. What happened to him? Oh, the old man died (later I remembered there was a story that he was murdered), and after the nationalisation of property in 1971, the children left and went to Europe and America. What about you? I ask. Oh, we stayed, and now business is good. I look around at the shelves laden with electronic goods, all imported. For ten years, during the height of the socialist experiment in Tanzania, you could be arrested for having a bar of soap imported from outside. Now, however, people are reclaiming their properties and businesses, even, in the case of one Greek farmer, their farms. But it’s too late for some families, all the children have gone elsewhere, married and settled, and are lost to Tanzania. I continue walking, through a quarter of African shops, with mattresses piled high on the pavement, and hand painted signs, and the infectious sound of Congolese music blaring from radios. It reminds me of West Africa, and I realise I probably never saw it in my earlier life, circumscribed by a European lifestyle with its rigid proprieties. I walk on, up a wide tarred road, and in front of me I see another well-remembered monument of the past: the Greek Orthodox Church. As a teenager, given to seeing the world in terms of poetry, I used to see its round white dome as a replica of the snowy peak of the mountain which hung above it. I walk around it in delight, and through the open door someone sees me from inside and comes out to say hello. It is the pastor, but not a Greek, a Tanzanian, and he tells me the church was sold by the Greek community to the Southern Baptists when all the Greeks left, but that they are now negotiating to get it back. ‘We are sympathetic’, he says, ‘we know what it means to them.’ Like all the Tanzanians I have met on this trip, he has a gentleness and dignity which instantly make me want to be like them. I can’t stop, in the dream I have to keep walking, and I go on. There’s a sign pointing to the Commonwealth war cemetery, and again, though this is not part of my memories, I’m curious and I follow it. I come to a low wall containing five straight rows of white headstones, engraved with the names of 95 men who died fighting for the British in the First World War. They are both Christian and Moslem, from the King’s African Rifles, the Army Service Corps, the East African Military Labour Service. The graveyard is beautifully kept, the headstones spotless, the grass clipped. The sun is getting hotter now, and an atmosphere of peace pervades the place, with only another solitary gardener watering nearby. Sitting there, on a bench facing the headstones, I realise how many preconceptions I’ve brought with me on this journey. I know Tanzania is a poor country, or was until recently, and therefore I expected a degree of ramshackleness, of corner-cutting and prioritisation of what should be looked after. The careful tending of these graves, years after anyone probably remembers their occupants, moves me and makes me reconsider my prejudices. I walk on, in search of more immediate human contact, and stop for roasted corn and a peeled orange at the side of the road. The stallholder has several chickens in a cage, and I watch a customer bargain for one of them, holding it in his hand to test its weight. My mother did the same at the market in the old days, and we’d take the chicken home and feed it up for a week, before slaughtering it for Sunday dinner. I remember watching the gardener chase and catch the poor bird, and cut through its neck with a panga. I once took a stick and stirred the pool of blood it left on the ground, and was surprised how sticky it was. I couldn’t eat the chicken, and still can’t to this day. When I notice the stallholder is holding the chicken down in the act of sawing through its neck, I get up and say goodbye.